Gelmaxx is loading our trucks and heading off to Las Vegas! 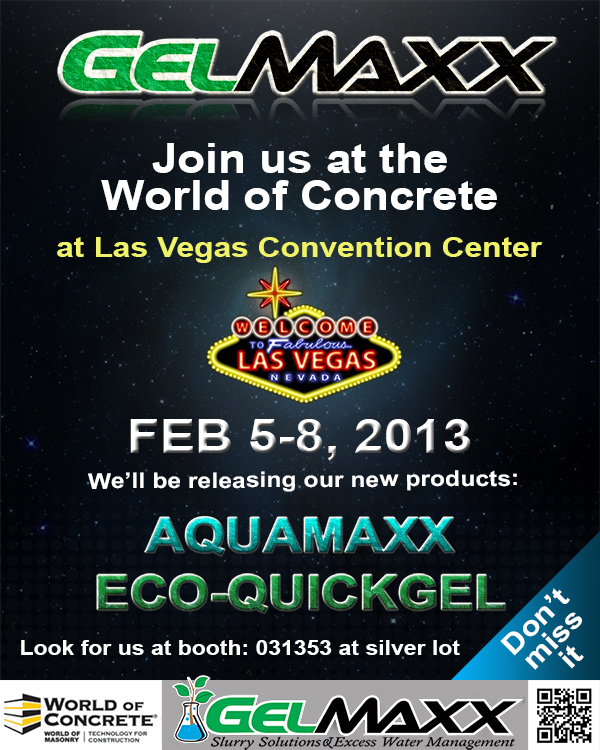 We're going to be part of this year's World of Concrete. This will be Gelmaxx's first year showcasing our products in our own booth! We are beyond excited to show everyone our new products, and how they can make slurry cleanup easy for anyone. What we'll be demonstrating is how to use AQUAmaxx to separate your slurry solids from the water. Through this separation, you are able to cut down on waste and have reuseable water for your jobsite machines. No longer do you need to run back and forth getting water when you have a fresh supply waiting to go. We'll also be demonstrating how our ECO-QUICKgel can solidify the slurry waste into a product that is easily disposable in any standard trashcan because it complies with the EPA 9095B Paint Filter test. There are so many simple methods to apply ECO-QUICKgel to get rid of the slurry. For example, after vacuuming the slurry, you just need to mix in a 2lb bag of ECO-QUICKgel to your 55 gallon drum. Or you can lightly coat the concrete slurry on the ground, and just use a vacuum, like from Dustless Technology, to pick it up. That way it saves you a step, and you don't have to mix the slurry and ECO-QUICKgel. If you want to see a demonstration of how that works, just check out our video HERE. But that's not all we'll be showing off. We have amazing new machines that are custom built to perfection. Our concrete slurry pump is guaranteed to be the talk of the entire show because of the way it separates the slurry particles from the water. It will save you time and money because the more times you reuse the water with AQUAmaxx, it allows the solution to separate more quickly and efficently. Thus, when using this AQUAmaxx water on your jobsite machinery, it's already primed to separate the concrete slurry and the water while its being applied on the floor! Think about how much waste you've reduced. If you plan on heading to the World of Concrete, you need to make sure to stop by our booth because of the amazing giveaways we have ready to hand out. Make sure to get your lanyard, chapstick, and Gelmaxx t-shirts before they all run out! However, that's not even the best prize. 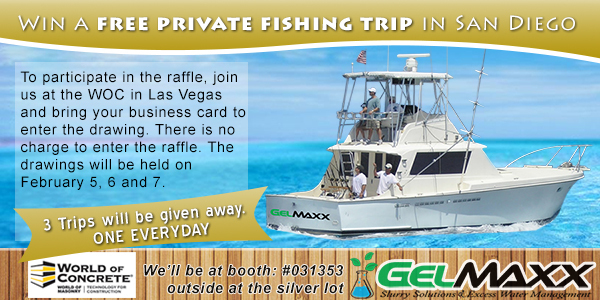 Gelmaxx is giving away not one, not two, but THREE PRIVATE FREE fishing trips in beautiful San Diego. All you need to do it come by our booth and drop your business card in our fish bowl. You have three chances to win since there will be one winner each day from February 5-7. This is certainly a trip that you want to win! Gelmaxx also has the privilege at this year's show to be the exclusive company to handle all concrete slurry waste at the convention. So be sure to check out our logo on each waste bin! Oh, and did we mention that we are nominated for the Most Innovative Product at the World of Concrete? It is such a coveted titled and would be a great honor to recieve it. So everyone at the convention should for Gelmaxx! You can vote at photo displays kiosks located at the World of Concrete Bookstore in the Grand Concourse and adjacent to the Product Show Case area near Registration in Central Hall. Two additional ballot kiosks will be near the entrances to North Hall and South Hall. Exhibitors who have nominated products in the MIP award program will also have ballots. Click HERE for more information. Gelmaxx is excited to get our products in your hands. So we hope to see you all in Las Vegas!